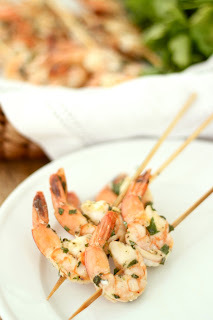 These Lemon Basil Grilled Shrimp Skewers were a Summer staple for me as a caterer- always one of the first things to go. After I had served these a couple of times I had to raise the price of these on my menus because I was having to prepare so many of them to keep up with the demand of the guests... I never wanted to run out of anything. As I've mentioned before, I'm a stickler for making sure that everything on my menus goes well with each other... I find that these are much better to serve at a party than traditional shrimp cocktail because the flavors of the herbs and lemon go much better with a drink and other menu items than a strongly flavored ketchup based cocktail sauce. They are perfect party food- flavorful, elegant, easy to prepare in advance and easy to eat. This recipe was inspired by a Barefoot Contessa recipe - she served them as a main course with pesto pasta... also one of my favorite ways to enjoy them. You can find the skewers, here, that make these look great and perfect for a party. In a bowl, combine garlic, basil, parsley, dijon, lemon juice, olive oil, salt and pepper. Combine well with a fork. Add shrimp and toss. If time allows, let the shrimp marinate for 1 hour or over night. Soak wooden skewers in water for 1 hour. 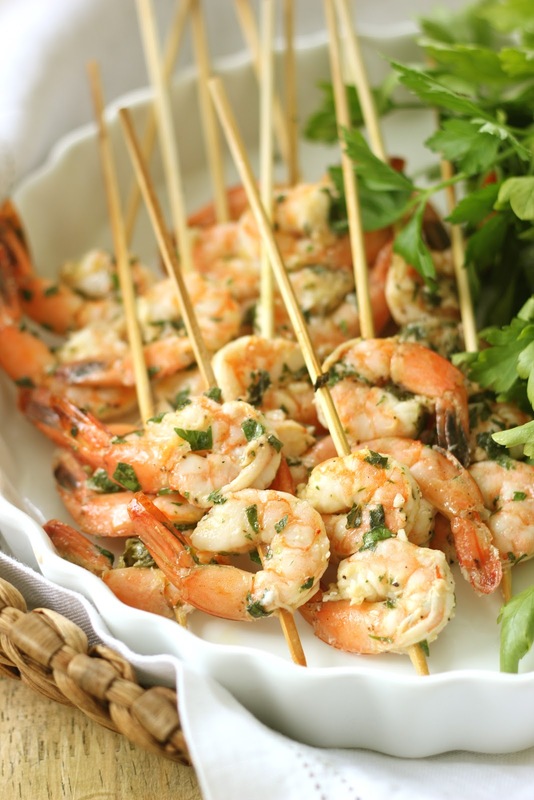 Skewer shrimp onto the sticks. Grill for 1 minute on each side until pink. Serve warm, at room temperature, or refrigerate and serve cold. If the weather isn't cooperating for the grill, they can also be prepared in the oven- just roast them at 450 degrees for 5-7 minutes. 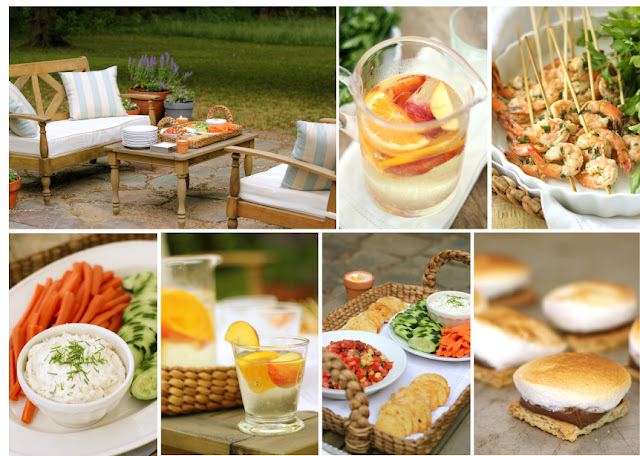 Stop by Everyday Occasions, The Store for more of my favorite entertaining essentials that make entertaining easy. These are delicious! I opted to roast the shrimp in the oven at 400 (I have no grill!) and they turned out so flavorful. Thanks so much for thes recipe!!!! I tried this recipe for dinner tonight and LOVED the marinade! Anyone tried to just buy pre-cooked shrimp and just marinate in sauce? Totally delicious!! Both ways, grill and oven...oven is easier though. Love the flavor!